2.Prepare outdoor grill for direct grilling over medium heat. Remove pork chops from marinade; discard marinade. Place pork chops on hot grill rack. Cover grill and cook 13 to 15 minutes or until internal temperature reaches 140°, turning once halfway through cooking. Transfer pork chops to large serving platter; let stand 5 minutes. Internal temperature will rise to 145° upon standing. For an alcohol-free version, try using non-alcoholic beer, sparkling apple cider or vegetable stock. The apple cider would add a naturally fruity note, while the vegetable stock would add a rich flavor. To cut back on refined sugars, substitute the brown sugar with pure maple syrup or honey! 1.In large nonstick skillet, cook bacon over medium heat 6 to 8 minutes or until crisp, stirring occasionally. With slotted spoon, transfer bacon to small bowl; reserve bacon fat. 2.Add bell peppers and onion to skillet with bacon fat and cook 2 minutes, stirring frequently. Add corn and cook 4 minutes or until vegetables are tender, stirring occasionally. Remove skillet from heat; stir in lemon juice, basil, Worcestershire, black pepper and bacon. Makes about 6 cups. For a vegetarian-friendly version, in place of the bacon, sauté peppers and onion in 2 tablespoons coconut oil for a rich flavor! Stir in 1 cup of black beans to get an extra boost of protein, iron and fiber! 1.Prepare outdoor grill for direct grilling over medium heat. In large bowl, combine oil, chili powder, salt and cayenne. Add potatoes and toss to combine. Cut two 18 x 30-inch sheets of heavy-duty aluminum foil and place on work surface. Place half of potato mixture in center of each piece of foil. For each packet, bring top and bottom sides of foil up and together over center of potatoes, and fold down twice to make a double fold over potatoes. Double fold both open ends of foil packet toward potatoes. 2.Place packets on hot grill rack. Cover grill and cook 30 minutes, turning once halfway through cooking. Carefully remove potato packets from grill; let stand, sealed, 5 minutes. 3.Carefully open 1 end of packets to let steam escape, then pour potatoes into large serving bowl. Serve with maple syrup for drizzling. 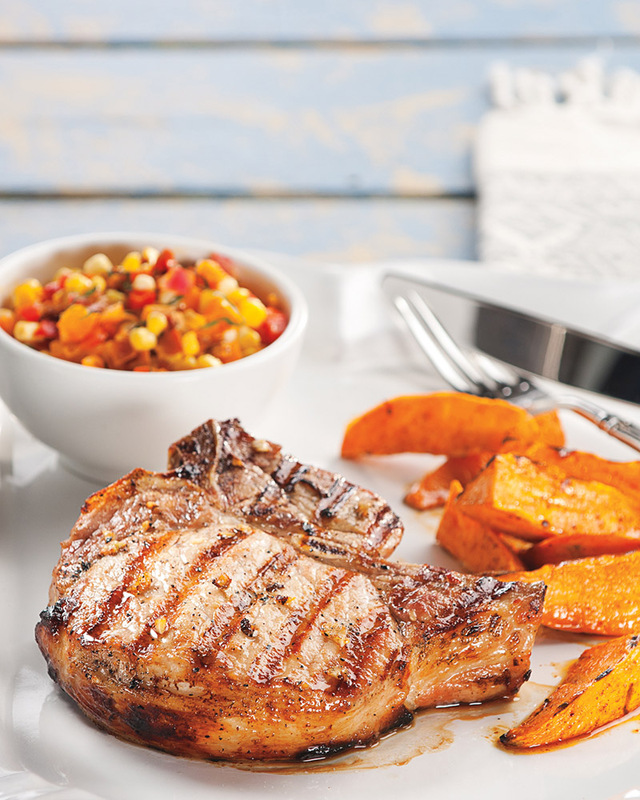 Pair the sweet potatoes, corn sauté and pork with a Garlicky Lemon Yogurt Dip! Mix together: 6 ounces plain Greek yogurt, 2 garlic cloves (minced), 1 teaspoon lemon juice, 1/2 teaspoon parsley flakes, 1/4 teaspoon coarse salt, 1/4 teaspoon cumin powder and ground black pepper to taste!